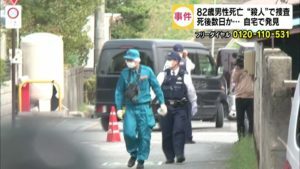 IBARAKI (TR) – Ibaraki Prefectural Police are seeking the help of the public in locating a man who wielded a timber block during the robbery of a convenience store in Shimotsuma City early Friday, reports TBS News (Aug. 17). 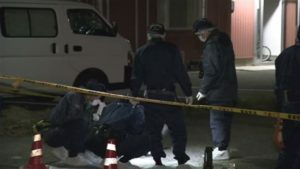 At around 12:30 a.m., the man entered an outlet of 7-Eleven, located in the Kurokoma area, while carrying the block, measuring roughly one meter in length, and threatened a 24-year-old female employee. “Hand over the money,” he reportedly threatened. 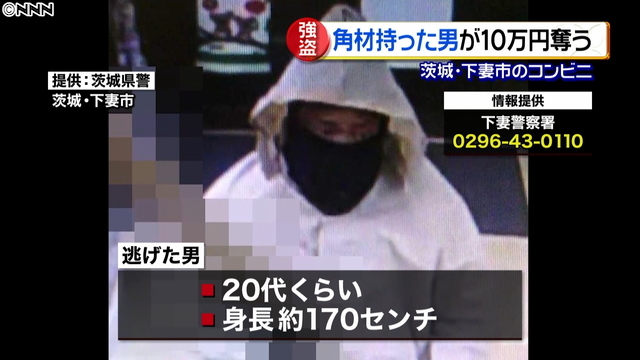 The perpetrator then fled with about 100,000 yen from a register. The female employee was not hurt in the incident, police said. In security camera footage released publicly by police, the perpetrator is shown wearing a hooded white sweatshirt and a black muffler over the lower half of his face. 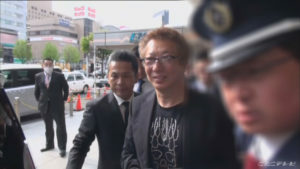 Standing around 170 centimeters tall, he is believed to be in his 20s. Police are seeking his whereabouts on suspicion of robbery. Persons with information on the case are advised to call the Shimotsuma Police Station at 0296-43-0110.